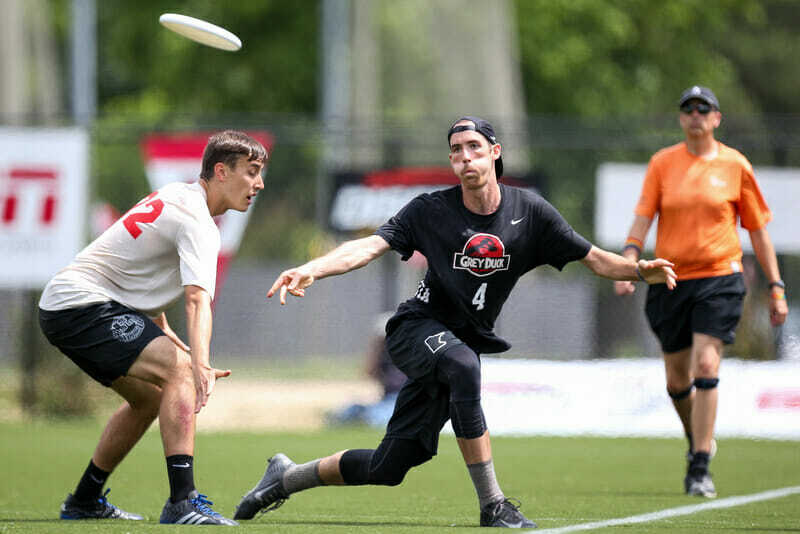 With Club Nationals right around the corner, eyes are firmly fixed on what will transpire in Rockford, Illinois, with a new format and some tantalizing matchups. But the 2017 college season is already here, as many teams have started tryouts, held practices, and even traveled to early fall tournaments. We take a look at the top 2017 college programs to watch in this Too-Early College Preview. The surprise 2016 National Champions lose their Callahan nominee Ryan Osgar, a superbly talented offensive player (27 assists at Nationals) and key leader in their run to the ‘ship. But you only need look to Grey Duck’s semifinal vs. Pittsburgh to see the depth they have. Without Osgar, without talented handler Tristan Van de Moortele, without D-line standout Sam Bumsted, and without freshman phenom Cole Wallin, Grey Duck still managed to win the game. Of course, Ben Jagt had a little something to do with it. The gargantuan deep threat, along with John Stubbs, is an early favorite for 2017 Player of the Year, and he demonstrated why throughout Nationals. 23 goals and 17 assists don’t lie: he’s that dominant. Wyatt Meckler, Van de Moortele, and Sam Kaminsky form a platoon of incredibly talented handlers. Most teams would be ecstatic with a 28-4 overall record. UMass 2016 was not. An incredibly successful regular season saw them head into Nationals with the number one overall seed. They proceeded to severely disappoint, failing to win their pool and then losing to eventual champion Minnesota in prequarters. Zoodisc 2017 aims to prove that their regular season dominance can and will extend to nationals. First, however, they’ll have to deal with the elephant in the room: how to replace Jeff Babbitt. The two-time Ultiworld Defensive POTY’s mere shadow made opposing handlers think twice about deep shots, and his absence in Zoodisc’s signature zone can’t be overstated. But even without Babbitt, this team should feel confident. Tannor Johnson is a bona fide superstar (as a sophomore, no less! ), a terrifying combination of size, throws, and ultimate IQ. Connor Kline, if anyone forgot, led 2015 Club Nationals in goals, while Ben Sadok and Brett Gramann (fresh off a summer with Doublewide) are perhaps the best 1-2 handler punch in the country. Zoodisc also features a cast of role players few other teams can match. Solomon Maerowitz-McMahan, Jeff Dreyfus, and Carlo Cincotta are all back and ready to help UMass prove that they are legitimate national title contenders. 2017 could very well be the year Ego finally gets the monkey off its back. Despite losing two veteran defenders and leaders in Chris Strub and Will Watkins, the core remains intact. Clark is perhaps the least-talked-about elite handler in the division, and his smooth throws more often than not are finding Rees or Matthews in the endzone. Meanwhile, one of the best freshman classes in the country (last year) will only get better. Will Lohre and Xander Cuizon Tice especially will benefit from club playing experience with Johnny Bravo and Rhino, respectively. To top it all off, Oregon has the best incoming freshman class this side of Carleton, with U20 Worlds players Colby Chuck, Duncan Fitzgerald, and alternate Ted Sither being the most notable. Proven leaders, great depth, and fantastic coaching (Jay Janin). This team is the real deal. Wisconsin could have been in somewhat of a pickle if its seniors elected to not use their final year of eligibility. Luckily for the Hodags, all the big names are back. Avery Johnson returns to lead the offense with smooth handling and veteran leadership. Ross Barker was perhaps the Dag’s best overall player in 2016, and has been a goal-scoring machine for Madison Club this summer. 2016 Callahan nominee Aaron Spiess won’t be easy to replace, but if anyone can do it, it’s Barker (15 goals at 2016 Nationals). Players like Nick Vogt, Eric von Kampen, and David Yu will also need to step into larger roles should Wisco hope to repeat its 2016 success. The top-end talent is undoubtably there, but the Hodags’ biggest key for success this year will be their depth. Upperclassman shouldered a lot of the Hodags’ heavy-lifting last season, perhaps at the expense of developing younger players. It will be those players, perhaps even more so than their superstars, that determine how successful the 2017 Hodags will be. Of note: 13 players from the Hodags’ probable 2017 roster played together this summer on Mad Men. The chemistry developed there definitely won’t hurt. After a “rebuilding year” that saw them make the National semifinals, Darkside is only going to get better in 2017. While Warshauer (23G, 8A at Nationals) departs, the fact remains that Darkside wasn’t dependent on him and other graduating seniors for a successful 20171. That distinction belongs to their still-young core of Matt Gouchoe-Hanas, Nathan Kwon, Walker Matthews, and now-sophomore Elijah Long. While Darkside has certainly missed out on some of the top-end Carolina talent of late (Sol Yanuck, Dillon Lanier), they still consistently refill their coffers with talented and experienced freshman from the area. With another year under their belt, and with experience on the (almost) biggest stage, Darkside is a legitimate title contender in 2017. Perhaps more than any other team, UNCW’s 2017 prognosis is dependent on what seniors (if any) return for a fifth year. Xavier Maxstadt and Charlie Lian — a pair of gunslingers that the Seamen based their offense around — are definitely gone. Maxstadt’s lack of fear in throwing unconventional throws opened up the whole field, and while it sometimes didn’t work out (see 2016 Nationals), when he was clicking, so was Wilmington. Wilmington’s offense may have to change to be more conventional, as replacing Maxstadt is simply not going to happen. Willie Stewart and Grayson Sanner showed flashes of brilliance in 2016; both will be relied on heavily in 2017. The team will add former foe JD Hastings from UNC which will be a nice boost to the defense. Meanwhile, should McGrayne, Matt Mason, Erik Esposto, and/or Jake Gallagher return, this team’s potential skyrockets. Jack Williams is returning and is a potential POTY contender, and can take over games almost solely with his athleticism. While returning all of those guys would be huge, Williams is far and away the keystone to a successful 2016 season for Wilmington. The surprise of 2016, Harvard Redline rode stellar play from Mark Vandenberg (10G, 30A) and John Stubbs (26G, 26A) all the way to the National final. Any hope of returning to that hallowed ground left when Vandenberg declined to return for his 5th year. Yes, Redline has the odds-on favorite for POTY in Stubbs, but one player can only do so much. Vandenberg and Stubbs had the chemistry and experience to single-handedly win games, as they showed over and over at Nationals last season. Big man Alex Hem, handler Ben Scharfstein, and utility man David Reshef were also incredibly important to Harvard’s run, and all will not be returning. While this is undoubtedly still a very talented team, the odds of repeating their deep 2016 National runs are dim, at best. But, if we’ve learned one thing from the past season, it’s never doubt John Stubbs. Much like UNC, CUT’s young core is finally coming into its own, and 2017 looks to be the year they cement themselves at the front of the pack. Perhaps more than other other college team, CUT benefits from incredible youth talent, especially from the Seattle area (and recently, the Triangle area). 2017 is no exception, as junior worlds players Dillon Lanier and Stanley Birdsong will both provide immediate impacts. Looking up and down the CUT roster, it can be tough to find players who don’t have world-level experience. Sol Yanuck, Alex Olson, Natan Lee-Engel, Jake Ritmire, Jesse Bolton…the list goes on and on. Meanwhile, Henry Fisher and Eric Taylor, despite having no WJUC experience, both broke out for CUT in 2016 and should continue to dominate this season. Fisher is the classic deep cutter: fast, tall, and great in the air, while Taylor is a shutdown defender, and both will have only gotten better after playing the club season with Ring of Fire and Sub Zero, respectively. Losing center handler Justin Lim would be devastating for 99% of teams in the division: don’t expect CUT to skip a beat. Phew! Don’t worry, Sundodger fans: Khalif returns for a fifth year, and with him returns Washington’s hopes and dreams. Not that the Sundodgers wouldn’t be competitive without him; they still have talented handlers like Benaloh and Delgado, and return the very talented but oft-injured DY Chen for a fifth year. But El-Salaam’s combination of leadership, athleticism, and throws simply can’t be replaced. More than once he has almost single-handedly willed his team to victory. With him, and Washington retaining all their key contributors, the team should finally be able to make a deep run at Nationals. Losing Sam Little hurts, especially on the defensive side of the disc. But Georgia still has plenty of players capable of taking over games. Parker Bray was a revelation on offense last year, deftly facilitating the disc and dominating downfield. 2016 Ultiworld Breakout Player of the Year Nathan Haskell is only going to get better, but perhaps the biggest factor in Georgia’s success this season could be the return of a (finally) healthy Sebbi Di Francesco. After missing the entire 2016 Spring season with a torn ACL, the homegrown Di Francesco is back and more than capable of leading Jojah’s Dfrom the handler position. This team is a semis dark horse. More than any top team (besides Texas A&M), the expectations for Pittsburgh will be severely diminished in 2017. But we knew that. Forget about trying to replace just the Callahan winner Trent Dillon; who can open the field up as well as Pat Earles? Who can combine a deadly assortment of throws with elite speed and ultimate IQ like Max Thorne? Losing any one of those guys would devastate most teams in the country; lose all three and it’s a wonder En Sabah Nur didn’t just spontaneously combust immediately after taking that double game point semis loss. But it’s not all gloom and doom. While their top players chewed up a lot of the big minutes the past three seasons, there remain a number of talented role players that will need to step into the blinding spotlight. Andrew Lehmberg and Dylan Best served as sure-handed deep targets on offense in 2016; they’ll be expected to lead the O in 2017. Saul Graves will dominate the disc on defense, looking for big targets Kyle Hartley and Mike Ing (fresh off a season with Philly AMP). Sam Van Dusen and Carl Morgenstern will return and give Pitt some sorely-needed veteran leadership. But honestly? It’s impossible to predict what this team will look like in 2017; it’s just so markedly different than any in recent memory. It’s the end of an era in Pittsburgh; we’ll see how Nick Kaczmarek and co. handle it. Mamabird, much like UNCW, could benefit hugely from the return of a few fifth years. Oak Nelson, Wes Chow, and Jeremy Harker were all key components behind Mama’s surprise quarters run at Nationals, and without them, Colorado loses much of its depth. But regardless of who returns, make no mistake: this is Mark Rauls’ team. The small, explosive handler is a nigh-impossible cover for most collegiate defenders; he’s even been giving defenders fits this club season playing for Johnny Bravo. Despite being a first-year player on the team, Rauls has carved out a spot on the Bravo O-line, and has helped Denver defy expectations on the way to a very successful regular season. Rauls will be a legitimate POTY candidate in 2017, and could certainly be fighting with Stubbs, El-Salaam, and Jagt for the distinction at the end of the spring. His team, however, remains in question. Should the fifth years decline to return, Erik Hotaling and Isaac Chestler, two more Bravo newbies, will need to step up in a big way. What could have been a team struggling to stay in the national picture just took the leap to Regional favorite, simply due to the return of Joel Clutton and Dillon Larberg for 5th years. The two were TUFF’s best players in 2016, and, although they missed out on Nationals, they lose no major contributors. Few teams can match Texas’ height and athleticism; it’s been a lack of big throwers that has hampered their results in 2016. With Clutton, Larberg, and captain Logan Kinney returning, and with A&M falling off a cliff/Colorado’s future in doubt, 2017 could be the year of the TUFF. Put a fork in ‘em, they’re done. While this will still be a competitive team, a return to Nationals seems highly unlikely for a team that has now lost the two players that formed the basis for their offense. Dalton Smith, perhaps more than any other player in the country, was his team’s offense. His plethora of break throws, hucks, and over-the-tops made the lives of Dozen’s cutters exponentially easier. Losing him is the equivalent of getting table-topped. Losing main cutter Ben Lewis is somebody kicking dirt in your eyes while you’re lying on the ground. It’s time to enter full-on rebuilding mode in College Station. UCF, to put it lightly, is not what they once were. The old guard is gone, and with them went this team’s national title hopes. And while UCF might not be able to win it all this season, they nevertheless are more than capable of making it back to the big show. It’s going to fall to senior Michael Fairley to lead them there. Fairley is (and has been since his freshman year) a nightmare matchup for opposing defenses, able to use his big frame to break the mark and sky defenders with ease. But he can’t do it alone, and a sizable class of departing seniors aren’t going to make it any easier. Should fifth-years Little and Reedy elect to return, this team will certainly be in the mix at Regionals. If not, the Dogs need someone to step up in big way, or risk missing Nationals in back-to-back years. Comments on "Too-Early 2017 College Preview: Men’s Division"